Yep, there it is, kickin' up dust and driving around the Canadian backcountry. 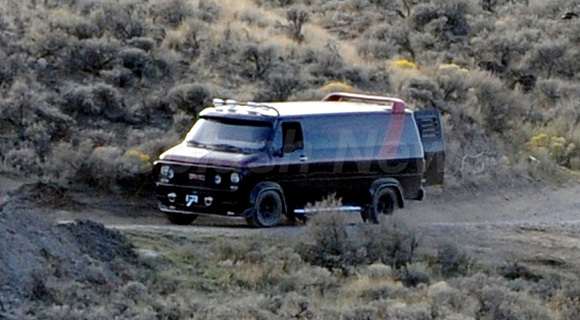 Splash News has landed the first few photos of the iconic black van from The A-Team being chased around British Columbia, Canada. Yes, we already know who's in the cast, yes we already know that this is shooting, yes we already know that Joe Carnahan is directing, and yes, now we know the van is back. There's really nothing more to say about this. I mean, it's a van, and it's supposedly got the A-Team in the back of it, but they're probably not there in this shot. Splash ends this the best: "There's no catching this testosterone-fueled, four-wheeled hellcat." This Joe Carnahan (Smokin' Aces, Pride and Glory) directed and Michael Brandt / Derek Haas (Wanted) written adaptation of the 1980's TV show is about a group of ex-Army Special Forces who work as soldiers while being on the run from the military for a crime they didn't commit. Starring as the elite A-Team are: Sharlto Copley as Capt. "Howling Mad" Murdock, Bradley Cooper as Lt. Templeton "Faceman" Peck, Liam Neeson as Col. John "Hannibal" Smith, and Quinton "Rampage" Jackson as Sgt. Bosco "B.A." Baracus. 20th Century Fox has already set a June 11th, 2010 release date next year. Stay tuned for updates as they arrive! WHO ARE YOU GUYS! WE'RE THE A-TEAM! please don't let this fail. I can't believe FOX is really making this. I sure hope FOX's IDIOT suits keep FAR away.......................and no cheese!!!!! I'll watch it for Sharlto.